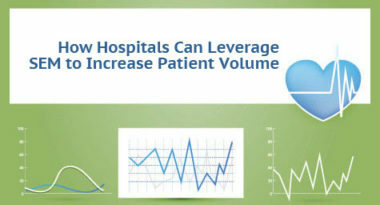 Search engine marketing (SEM) can be extremely effective for increasing patient volume. Many hospitals find it to be the most powerful inbound channel since it often generates the highest click-through rates (CTR) of all media in an integrated healthcare marketing campaign. To help healthcare marketers navigate search engine marketing and make the most of their SEM, MediaPost.com offered the following nine steps. 1. Check Consumer Sentiment on Google – Take the time to research the keywords people are searching for on Google. Look for the terms and areas of interest most frequently searched that also relate to the services you’re trying to promote. Check for the jargon and phrases that consumers commonly use to discuss the service, as well as more names for the procedures. 2. Confirm the Campaign Criteria – After gaining a solid grasp of the current search landscape, now is the time to match a procedure or service to these high-volume keywords. Broaden your keyword bank by adding similar terms that are both more generic and more specific to the services and procedures. This will ensure more comprehensive keyword coverage to help maximize the search results. 4. Come Up with a Compelling Call to Action – The call to action (CTA) can make or break a healthcare marketing campaign, so take the time to make yours powerful and persuasive so consumers have a reason to click. It must grab attention and allow for instant action after leading to the landing page. Maybe offer a free live webinar or let visitors download a complimentary eBook filled with information relevant to the procedure. A strong CTA must be established before it’s possible to write the actual Google ads. 5. Create Google Ads – Focus on promoting the call to action and make sure to include the name of the brand or center. Also, place the brand name after the call to action to lend credibility to the message. Consider taking an emotional approach that relates to improving their life or health, and then make it seem simple by only requiring a quick click. Finally, use action-oriented words to encourage the consumer to make their move and click. 6. Construct Landing Pages – Think of the landing page as an extension of the Google ad that provides additional information for consumers. Make the design clean, simple, and professional. Keep the copy concise and let it continue from the ad to steer the consumer to the call to action. Videos, testimonials, awards, and case studies can also be featured to further persuade prospects. In addition, include a form that consumers can fill out so they can sign up right away. 7. Arrange Tracking and Goal Conversions – Tracking provides proof of your progress. A popular tracker is Google Analytics, which is free, simple to use and directly connected to your Google AdWords account. Be sure to set up Conversion Tracking with Goals in order to understand and track the complete conversion path. 8. Place, Plot, and Perfect – The next three steps are place, plot, and perfect. This means placing the ad on Google, plotting the progress of the overall marketing campaign, and then perfecting all elements based on their performance to make them as effective as can be. This takes time and ongoing attention in order to see trends in performance and general success or failure. 9. Follow Up with Marketing Automation – Now is the time to send a follow-up email auto response message to those consumers who followed the call to action, filled out the form on the landing page, and either downloaded or requested additional information. Send out a series of five to seven emails filled with more information to give the consumer added value. Remember that the ultimate goal is engagement and action, so consider offering something that consumers will value like a free service or seminar. For those consumers who don’t respond, place them in an ongoing email program to maintain communication. Successful SEM is a process that demands time and tracking, but it’s also a proven tactic for converting consumers into prospective patients. Follow these nine powerful steps and watch the clicks and consumers come in. To learn more about integrating SEM into your healthcare marketing strategy, contact MDG Advertising. MDG Advertising, a full-service advertising agency with offices in Boca Raton and New York, NY, is one of Florida’s top healthcare marketing companies, whose clients include Dental Care Alliance, MDVIP, Max Planck Florida Institute, HCA East Florida, and Primary Pharmaceuticals. Our 360° approach uses just the right mix of traditional and digital marketing to reach your advertising goals. While some industries may fare better in print and others online, we strive to create a balanced approach, where traditional, digital, and search engine marketing efforts support each other and your message is tailored to the medium. To learn more about the latest trends in healthcare marketing and advertising, contact MDG Advertising. Read more at the Digitalmantra.com.